It’s October, which means it’s time to start with the scary stuff. First up is something I chose on the spur of the moment, because I just finished playing a long tabletop RPG campaign featuring demon hunters in a West Coast city, so when I saw a movie about urban demons, I figured I’d give it a shot. Fire City: End of Days is a one of those low-budget straight-to-video features that manages to be slightly notable for the fact that it was the feature directorial debut of Tom Woodruff, Jr., an effects make-up guy with a long career going back to the original Terminator. It is a story about demons in a modern-day city (which is recognizable as, but never named as, Los Angeles), who live in a disgusting tenement also inhabited by some truly wretched humans. From what I gather (because the movie is told in a rather roundabout fashion without a lot in the way of concrete exposition), the people living in the tenement are so horrid and miserable because the demons exert an influence to make them that way (and then feed off the misery). Until a demon oracle posing as a storefront psychic receives a message that something big and portentous is coming. She warns our protagonist, a demon named Vine, to be on the lookout for anything unusual. The demon make-ups are pretty good, thanks to the director being an expert and all. But if you’re wondering why there aren’t a lot of screencaps in this one, it’s because visually, it’s a kind of boring movie. There are a few decent shots, but most of the movie is this kind of underlit wanna-be noir with people glowering under inches of prosthetics. Anyway, despite a promising moment at the open showing Vine in silhouette texting someone else in the building that makes it look as if this movie might feature an amusing juxtaposition of ancient demons with modern technology, turns out this joke isn’t really a joke. The entire movie is ponderous and deadly serious and super hard-to-follow as far as who’s doing what and why. The upshot is that Vine performs an act of mercy, saving a young girl in the building from being raped by her mom’s shacked-up boyfriend, which apparently causes some sort of demon infection that makes the people in the building happy or something. They suddenly just ignore their own pain and fear and guilt (and magically kick their addictions) and turn their lives around to become productive citizens. Which means the demons are starving. It all wraps up in this really nonsensical conclusion where it was all a dream, maybe, because it somehow happened, but didn’t happen, and Vine becomes a kind of demon Batman, protecting and avenging humans from demonkind or something. I don’t really get it, and it’s not worth watching again to try and decipher it. Oh wait, there is one more sort-of joke in the movie. In the scenes where the demons are visiting the human inhabitants to see what’s up with them, one demon visits an apartment inhabited by this guy and his wife. That guy is Bob Burns, a fairly well known collector of movie memorabilia (now that Forry Ackerman’s dead, Burns apparently has the title of world’s largest collection of movie memorabilia). Burns got his start in Hollywood as a gorilla guy, back in the days when there were just a few, like three guys with gorilla suits who would get hired whenever a movie or TV show needed a gorilla. Starlog magazine did a long profile of Burns centered on hte elaborate Halloween productions he would set up with his special effects buddies in his yard and garage (one year, it was a time traveller routine, featuring the actual Time Machine from the George Pal movie, another year it was an Exorcist show, another year it was War of the Worlds with an alien capsule apparently crashed right through the wall of his garage). So yeah, there’s a Halloween connection here, but other than the one cameo from Burns and his wife and some well-done demon make-ups, there’s not much to see here. 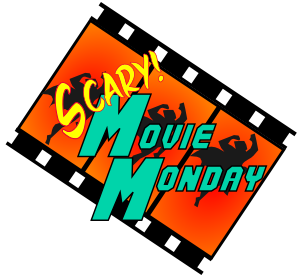 This entry was posted in Halloween, Super Movie Monday. Bookmark the permalink.